Chocobos! Belts! Leather flaps on stuff! Sweeping soundtracks! Pointy ears! Shapely butts! Especially the shapely butts. You can have it all. 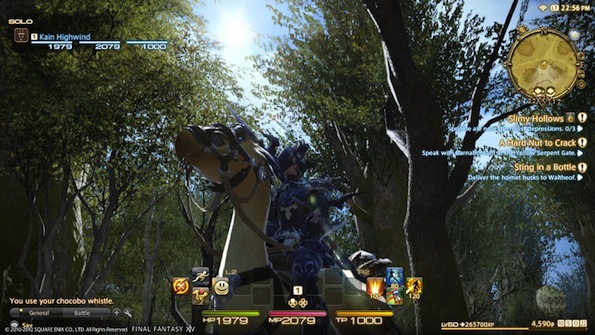 From today until Sunday morning, you can take part in the ongoing beta phase 3 of FINAL FANTASY XIV: A Realm Reborn, a Final Fantasy online RPG adventure that takes place in the sadly fictional but madly pretty Eorzea and Hydaelyn environments. This new phase of the beta showcases the FATEs system (it stands for Full Active Time Event, in Japanese Fu-ru Aktib Taimu Eben – one of my only skills in Japan was that I could translate English to phonetic Japanese English very well – I ate a lot of hotto-dogus and sandoichis). These are events that you may come across that you can choose to actively take part in, or pass by. For more info here are two of the game’s developers, Naoki Yoshida and Toshio Murouchi with their yoroshikus. “By achieving sufficient mastery in a certain class, adventurers will be able to begin undertaking the mantle of a related job. For instance, gladiators may rise up as paladins, stout swordsmen who shield comrades from harm; thaumaturges may aspire to become black mages, masters of offensive magic; while conjurers may find a new calling as white mages, masters of healing.